Hi, I am interested in your 1970 Chevrolet Chevelle (stock #4928-CHA) listed on Autotrader for $102,995. I'd like to get more information about this vehicle and confirm its availability. Pay close attention, because this 1970 Chevrolet Chevelle SS convertible really has everything you want. After all, you get an LS6 big block power, four-on-the-floor, and a great color combo. Plus, it even comes with the documentation showing its real-deal rare Super Sport droptop. 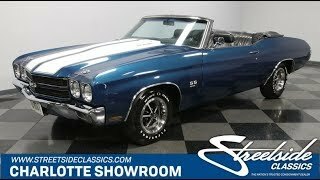 Chevrolet made less than 9,000 Chevelle convertibles, and only a small percentage were true SS machines, so you know this cars place in history is already secure. But theres much more going on here. Fathom Blue is this cars original color. There was an investment in a quality respray in 2012, and since then, it has been treated with respect a rare classic deserves. So it has a terrific clearcoat luster in the sunshine exactly what you want on a convertible. This car was made to show off, so even the hood alone has all the best elements of the muscle car era. This includes the iconic dual stripes, hood pins, and the cowl induction vent. Plus, you get all the other great features, like the form-fitting chrome bumpers, full SS badging, and Mag-style Super Sport wheels. And the white convertible top means this has a great color-matched attitude when its in place. When you take the roof down, a new attitude emerges. The full black package with bucket seats and a center console gives it the true muscle car aggression you expect from a Super Sport. Crisp door panels, good carpeting, complete dash, and insignia trim on the seats ensure youll proudly show this convertible off to the world. And the power convertible top makes this easy. But really, this is made for the driver to get the most enjoyment. The cue ball Hurst shifter is calling out to your right hand through the darkness. A dual spoke SS steering wheel means you get a clear view of the U14 gauge cluster with large speedo, tach, and working clock. Under the hood is the 454 cubic-inch LS6 V8. This car was actually born a L34 Super Sport, but it was upgraded to the ultimate level with an era-correct true LS6 motor. In fact, this was even rebuilt in 2015 to keep this true big block legend running strong. You can also tell plenty was invested in the presentation under the hood during restoration. The engine has bold paint and the shining valve covers are radiating from within the gloss black engine bay. Muscle car fans love to point out the rubber gasket around the air cleaner that gives potential for the true cowl induction hood. It inhales deeply from the four-barrel carburetor, and the header-fed dual exhaust gives it a great rumble. Best of all, you are in complete control of this huge muscle and its thunderous soundtrack thanks to the Muncie M21 close-ratio four-speed manual transmission. This feeds a versatile 3.31 rear end with Positraction. This is strong running all the way around with features like power steering, front disc brakes, the correct boxed trailing arms, and sway bars front & rear. A classic this special needs all the right paperwork, and so the sale comes with original warranty card, owners manual, service manuals, and the important factory buildsheet. This is a true fantasy-level muscle car, and if youre quick enough to grab it, your dreams can become a reality. Call now!